NOTHING is stopping students at Ormiston Forge Academy in Cradley Heath from achieving success in both the academic and extracurricular fields. The achievements of the Academy’s top students were recognised during a prize-giving ceremony at Champions Church in Netherton last week. The annual event celebrates the achievement of students over the academic year and regularly attracts a capacity audience of over 800 people. More than 200 students from Forge were recognised for outstanding achievements in a wide range of academic, extracurricular and social aspects of school life. As part of the school’s drive to improve literacy skills every prize winner received a national book token. The themes of the evening were the core values of the school which are respect, aspiration and resilience. Many of the speakers took the opportunity to talk about personal experiences relating to the values. After delivering an inspiring speech aimed directly at the students, Dr Emmanouil Nikolousis presented students with the community awards. Dr Nikolousis is the clinical director of haematology and stem cell transplantation for the Heart of England NHS Trust. Other awards were presented by the chair of governors at Forge, Siddique Hussain, the head of academy at Forge’s sister school Tenbury High Ormiston Academy, Vicki Dean, executive principal over both Tenbury High and Forge, Andrew Burns, and head of academy at Forge, Lisa Mason. Champions Church was packed to the rafters and throughout the evening, performing arts students kept the audience entertained with readings and musical numbers including a show stopper from Legally Blonde The Musical. 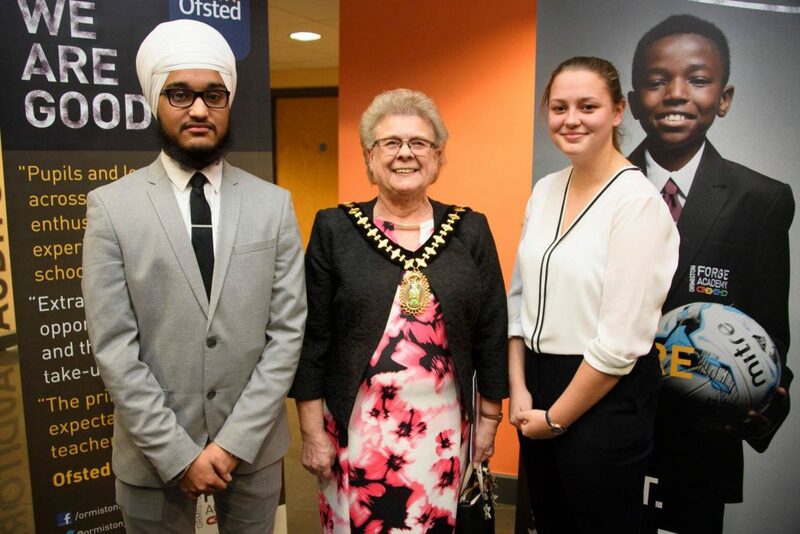 The ceremony was graced by The Worshipful the Mayor of Sandwell, Councillor Joy Edis who joined Head Boy and Head Girl for photos at the start of the evening. In their speeches both Head Boy, Vikramjeet Singh, and Head Girl, Lauren Southall, told very personal stories and spoke eloquently about overcoming odds and being the best you can be. The positions of Head Girl and Head Boy provide a key leadership and a supportive role for students across the Academy. The roles are selected annually and are open to all students in year 12 ahead of their move to year 13. The roles of Head Boy and Head Girl are instrumental in supporting all students as they arrive and progress throughout the Academy. Head of school, Dr Lisa Mason, congratulated parents on their efforts to raise good children as well as thanking the teachers for nurturing students. Also present at the ceremony from Forge’s sponsor, Ormiston Academies Trust, was the director of education, Rob Pritchard. There was also a presentation of a special award to Louise Morris who is the CME (Children Missing Education) & Alternative Provision Officer for Sandwell. The tireless and determined work that Louise does means that young people across Sandwell, including Forge students, are looked after and have their safeguarding needs met. The award, seven industrial chain links forged and donated by local chain maker, William Hackett Chain Products Ltd, will be displayed in reception at the Academy. Each link represents a year for the Academy and is presented annually to someone who has made a positive impact on the local community. The links represent the proud history of the area, also symbolised in the Academy logo.